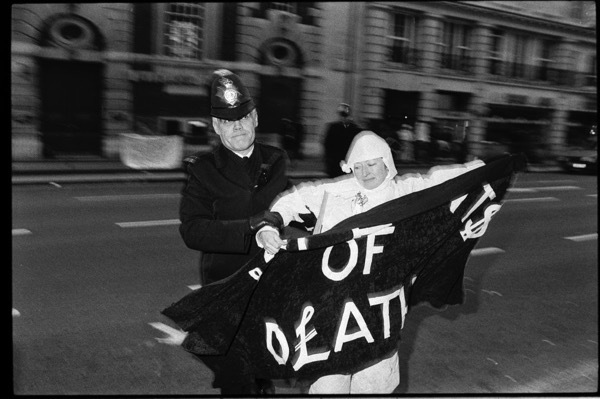 If we should ever need evidence that the spirit of the East End Suffragettes of a century ago is still with us, Contributing Photographer David Hoffman‘s astonishing images of women’s protest in the eighties are an enduring and inspirational witness to our unquenchable desire for justice. 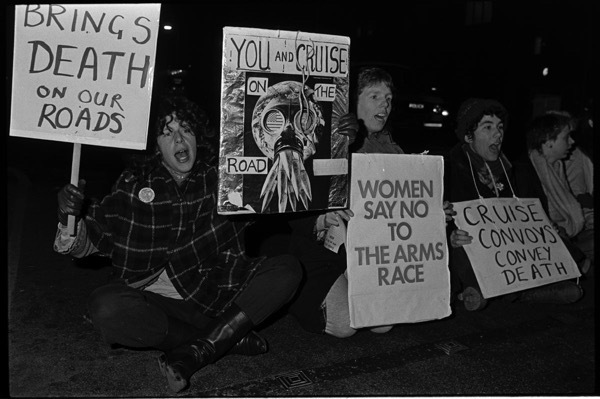 “Some of these photographs are of our gang, Tower Hamlets Women for Peace, along with two blokes from Tower Hamlets Campaign for Nuclear Disarmament, blocking the Whitechapel Rd near the Cambridge Heath Rd crossing early in the morning of Tuesday 20th Dec 1983. 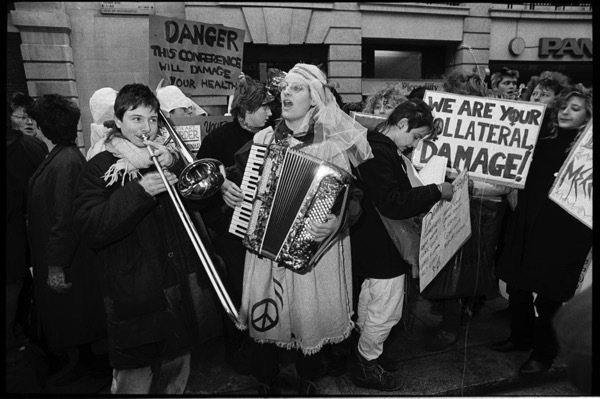 Most of us were nicked and defended ourselves in a remarkable court case at which we were all found guilty but unconditionally discharged. 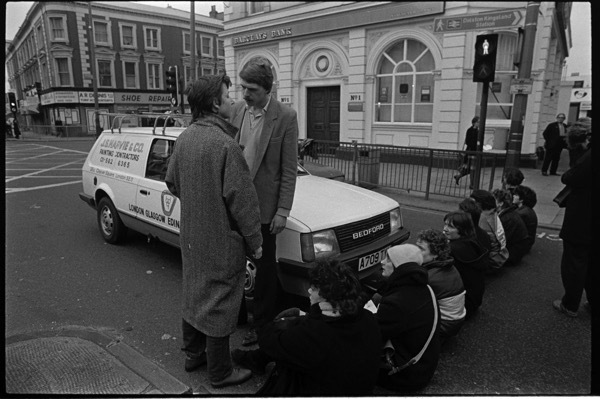 Other photographs show when we blocked Whitechapel Rd close to the Vallance Rd crossing, sometimes by crossing the road back and forth repeatedly rather than sitting down. 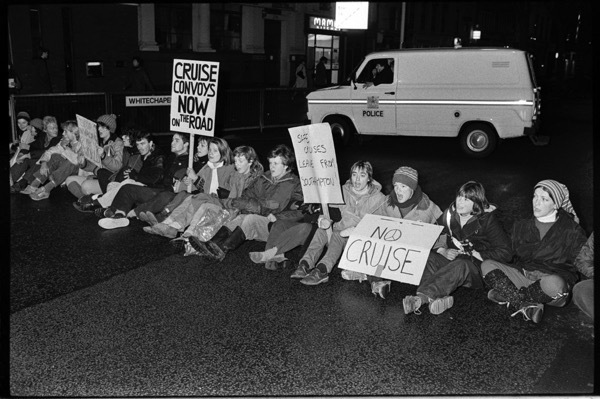 We did this whenever we got a message on the Greenham ‘phone-tree’ that Cruise nuclear convoys were on the road. 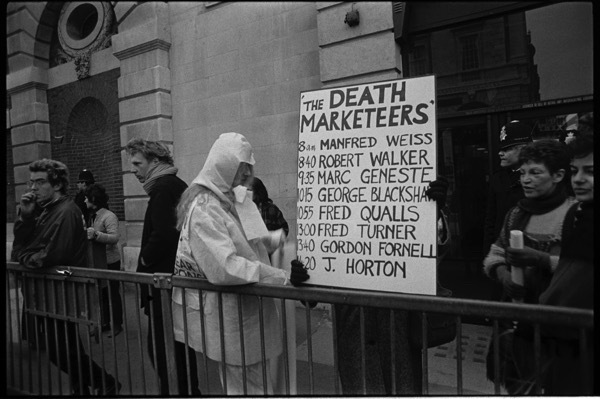 We wanted to publicise this as well as the fact that Whitechapel Rd is a Military Service Route to be taken over as such should our government or the United States government decide to wage a nuclear war. 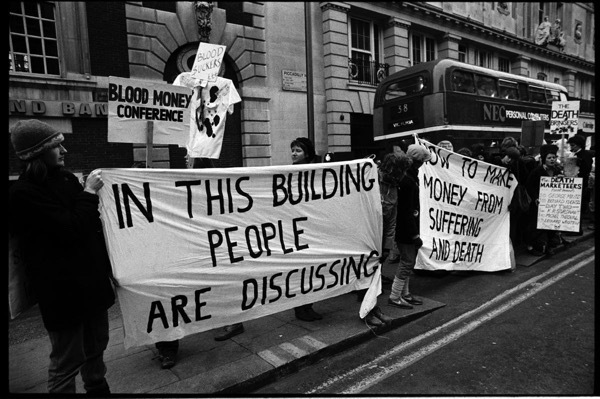 There are also photographs here of the Blood Money demo outside British Association of Film & Television Arts at 195 Piccadilly where there was a conference of arms traders and manufacturers on International Women’s Day, 8th March 1984. Our Peace Group joined others there to chuck red paint in their general direction. 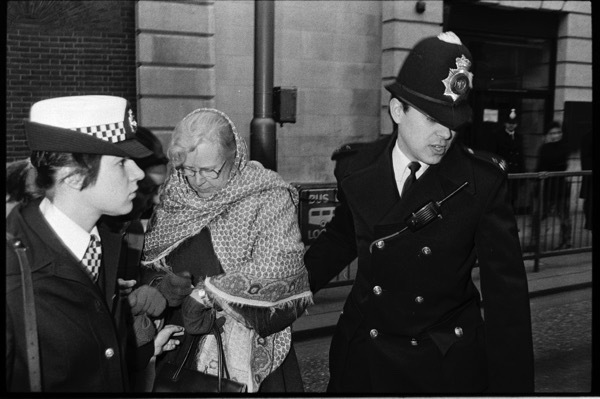 One of the pictures shows the arrest of an older woman in a shawl writing a note on her wrist, who was the one who had the good wheeze – sadly not possible on modern public transport – of hopping onto a bus and chucking her paint from the platform as it passed. Unfortunately, the cops caught up with the bus at the traffic lights. 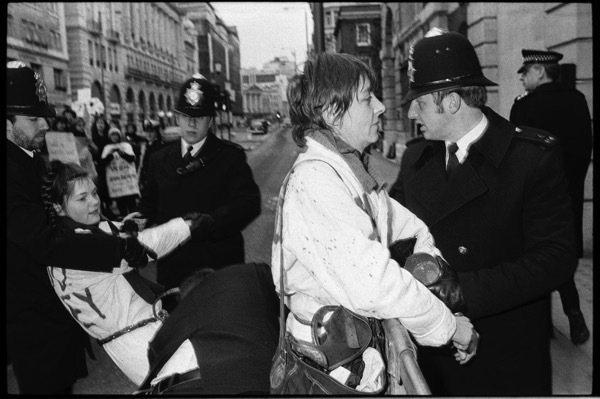 “I started photographing protest and other social issues in the seventies. 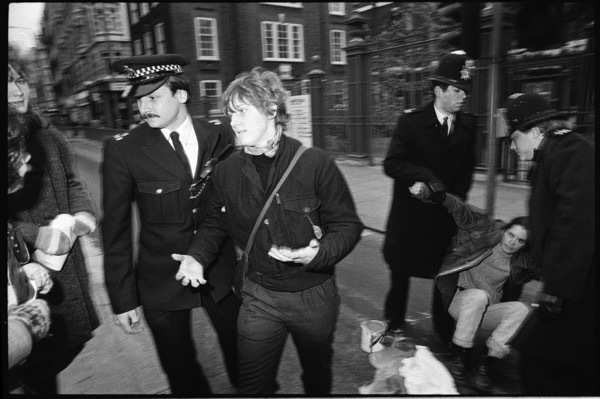 I was living in Whitechapel at that time and the women I knew were involved in squatting and generally trying to resist the horrors of the Thatcher era. 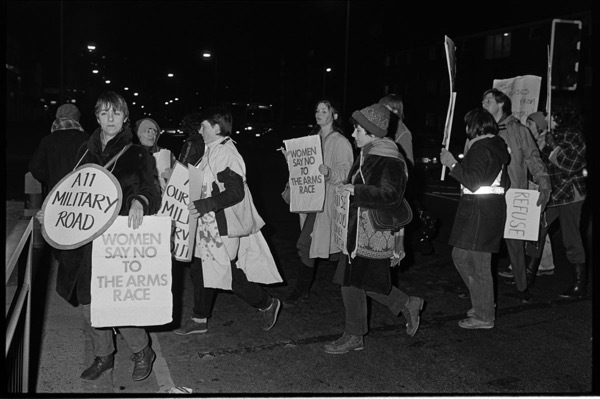 The women’s peace movement really took off with the establishment of the American nuclear missile base in Greenham and East End women were among the most active and committed. More great work from David Hoffman. 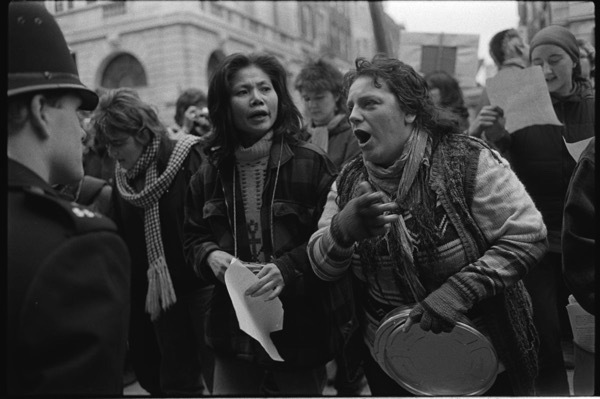 Women are still fighting for the same justice today. There are a few familiar faces in this collection! 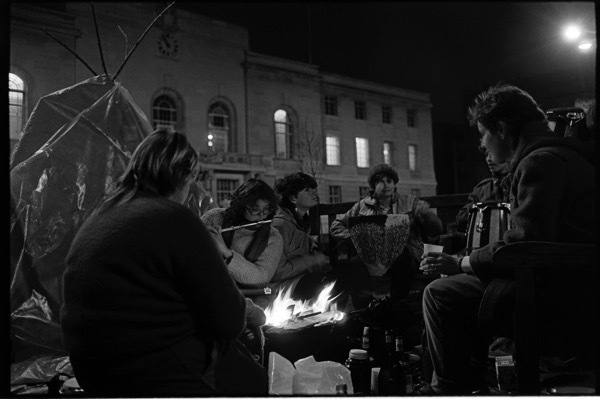 I was in Sheffield at the time working at a venue. 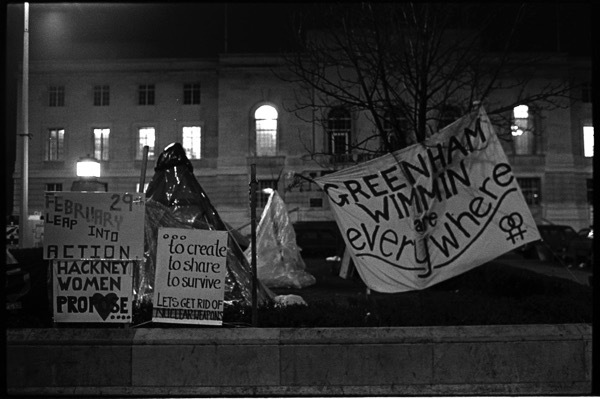 We did a lot of fundraising for Greenham Common and Miner’s Wives. 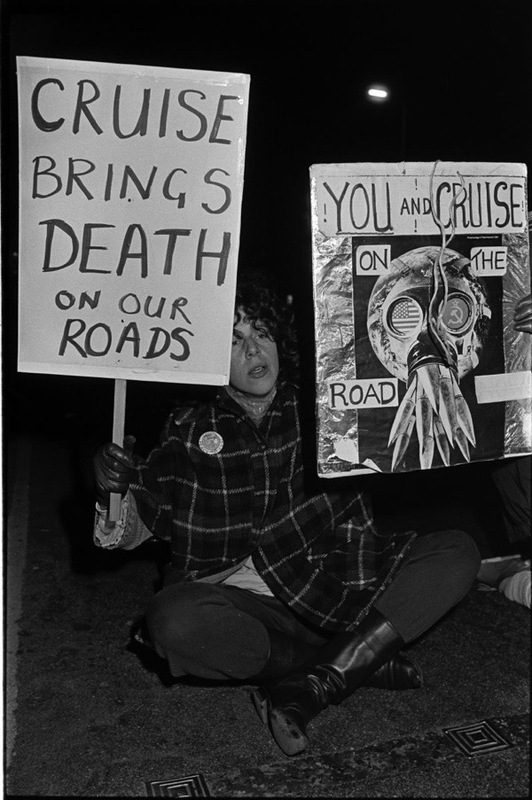 Went on some picket lines too, which was both scary & exhilarating. 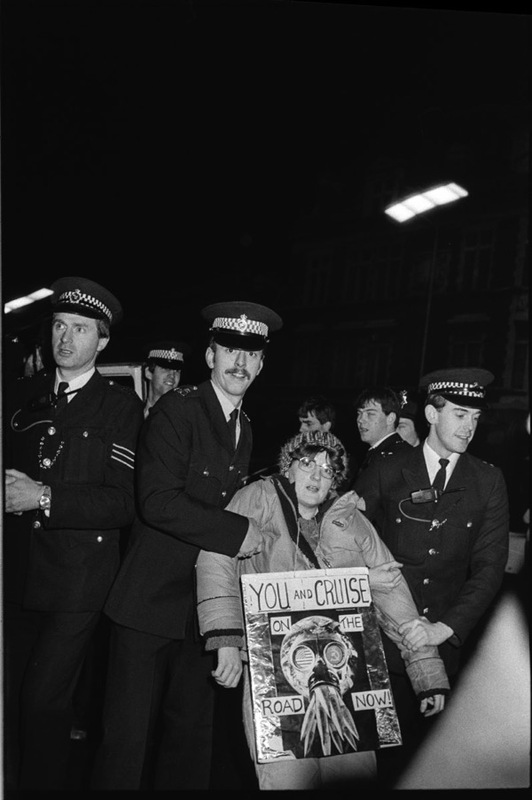 Nearly everyone in Yorkshire wore the yellow ‘Coal not Dole’ stickers – it was weird coming down to London during the strike, where hardly anyone was wearing stickers (though there were some). Brilliant. 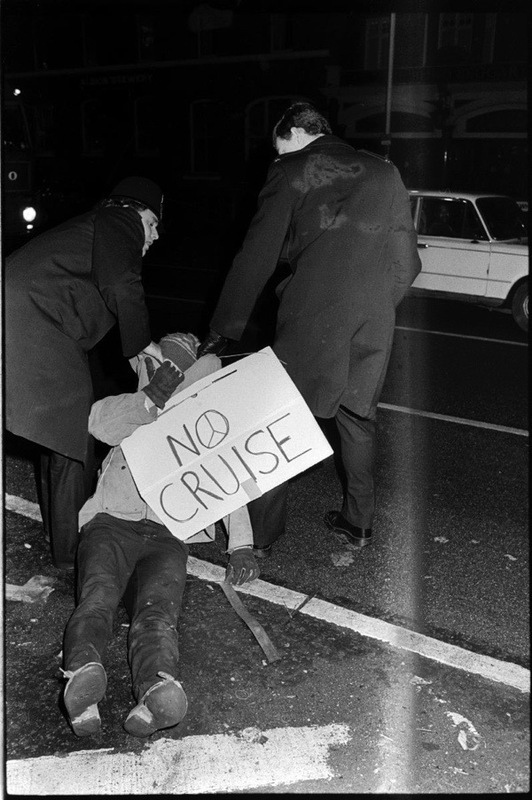 Wonderful pictures of East Enders’ activism. It has continued through each decade… My mother (who lived in Romford all her life and died of dementia last year) played a small part in this. 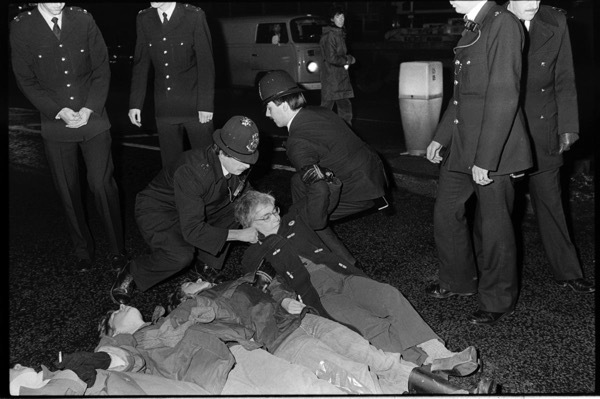 In the early 1960s I remember my brother and I being looked after one evening by my father, as this was very unusual. 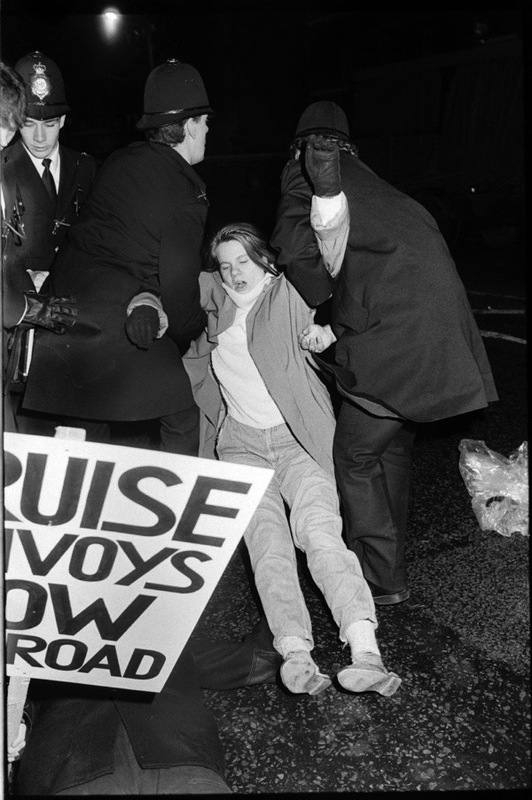 My mother had gone to Trafalgar Square and laid down to block the road as part of a ‘Ban the Bomb’ CND protest. 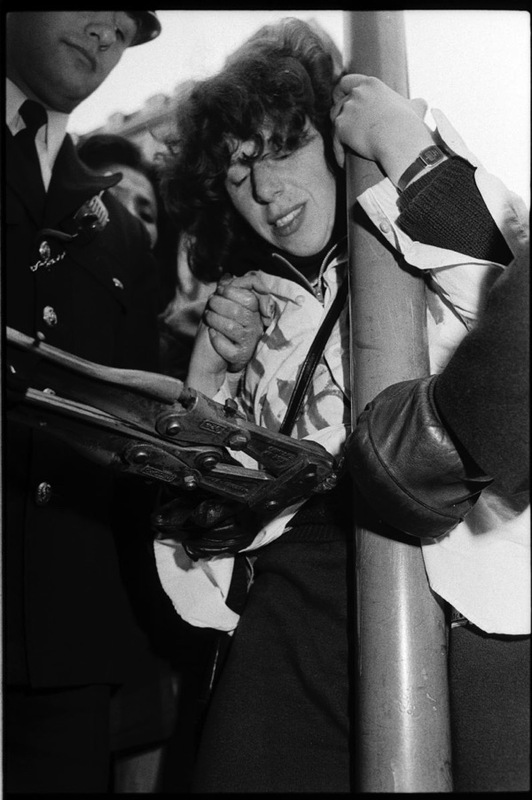 She was fined, a cost which was quite hard for her to pay. Great memories. Wonderful people. The highly talented David Hoffman doing what he does best. He has been jostled, manhandled, and had his teeth knocked out, but nothing stops him. His extensive photo library will be used by generations to come as a record of our times. 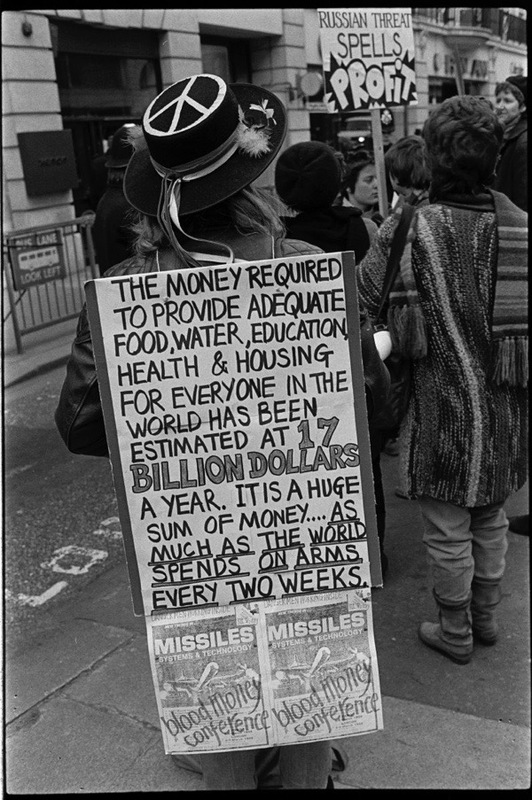 Fantastic social history. 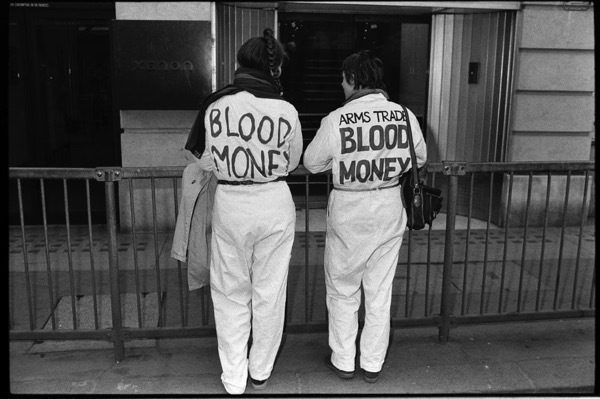 I am amazed BAFTA hired out its premises to arms traders during the 80s.